will transmit its location at an adjustable rate. tracking system using another technology you may like to look at our Choosing page. mobile tracker without the need for a full TNC. simple configuration tool which allows setting of all user options. OpenAPRS, APRS World and Findu.com. simply connect a scanner or radio to your computer’s audio input. Free firmware updates are released on a regular basis to add new features. serial cable using the configuration program. Includes a OpenTracker chip, PCB, and all components excluding cables. For those not interested in soldering together the kit. Case included. 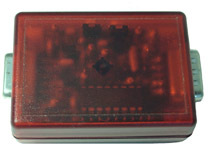 The OpenTracker is designed to fit this translucent plastic case. The case is pre-cut with holes for the DB-9 connectors. Also suits the WeatherTrak and the TinyTrak3. the configuration software and documentaion. NOTE: This is *PER ORDER*, not per item. is needed to connect a OpenTracker to a computer.